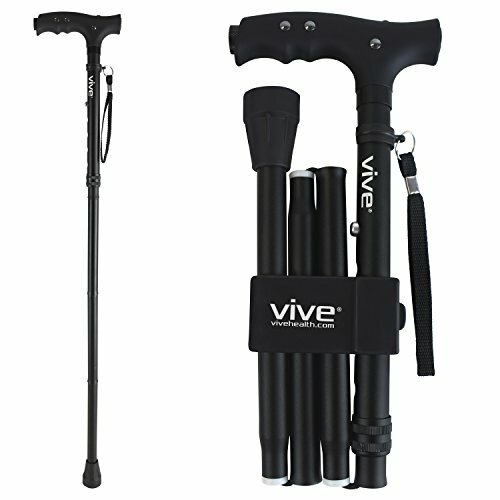 Easily illuminate low-light areas to safely navigate around obstacles and tripping hazards with the Vive LED folding cane. Integrated into the comfort grip handle, the bright LED light provides convenient, hands-free lighting when navigating in dim parking lots or simply walking to the bathroom in the dark. Easy to operate, the light switches on or off with a single push button located on the handle. The LED light operates on two AAA batteries which are included. Providing a convenient option for those needing additional assistance, the LED folding cane smoothly and securely locks in place to provide extra stability while walking on any surface. Folding at four points along the cane shaft, the collapsible cane is compact, easily fitting into a purse, briefcase, carry on or wheelchair bag. The included secure clip ensures the cane remains folded while in storage. Constructed with a durable, corrosion-resistant anodized aluminum, the folding cane is exceptionally lightweight yet sturdy, safely supporting up to 250 pounds. The cane is easily adjusted in one-inch increments from a minimum of 33" to a maximum height of 37". Capped with a slip-resistant rubber tip for additional traction and stability, the cane is also compatible with most replacement tips, including tripod tips, quad tips and ice tips. Ergonomically designed, the comfortable hand grip contours to the hand to reduce fatigue, prevent muscle cramping and relieve pressure on the wrist. The integrated wrist strap keeps the cane from falling to the ground when released. BRIGHT INTEGRATED LED LIGHTING: Easily illuminate low-light areas to safely navigate around obstacles and tripping hazards with the Vive LED folding cane. Integrated into the comfort grip handle, the bright LED light provides convenient, hands-free lighting when navigating in dim parking lots or walking to the bathroom in the dark. Easy to operate, the light switches on and off with a single push button located on the handle. The LED light operates on two AAA batteries which are included. COLLAPSIBLE COMPACT CANE: Providing a convenient option for those needing additional assistance, the LED folding cane smoothly and securely locks in place to provide extra stability while walking on any surface. Folding at four points along the cane shaft, the collapsible cane is compact, easily fitting into a purse, briefcase, carry on or wheelchair bag. The included secure clip ensures the cane remains folded while in storage. LIGHTWEIGHT ADJUSTABLE ALUMINUM FRAME: Constructed with a durable, corrosion-resistant anodized aluminum, the folding cane is exceptionally lightweight yet sturdy, safely supporting up to 250 pounds. The cane is easily adjusted in one-inch increments from a minimum of 33" to a maximum height of 37". Capped with a slip-resistant rubber tip for additional traction and stability, the cane is also compatible with most replacement tips, including tripod tips, quad tips and ice tips. ERGONOMIC HAND GRIP AND STRAP: Ergonomically designed, the comfortable hand grip contours to the hand to reduce fatigue, prevent muscle cramping and relieve pressure on the wrist. The integrated wrist strap keeps the cane from falling to the ground when released.